The Lyme Art Association is starting it's 2013 art shows with the 21st Annual Associate Artist Exhibition. I was informed that I am now an Associate Artist and eligible to enter this special show. Below are two of the four paintings that I'm delivering to the show. The jury may or may not include these painting so please check back while I wait to hear from the judges, probably by January 11th. 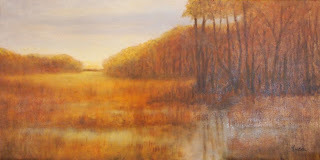 The marsh painting above is from the the Rough Meadow under painting in my "Plein Air Painting - A different Approach" posting. I've changed the title to Tidal Marsh because the stream in the above painting is a path at low tide and I wanted people to be aware that the water at high tide can be quite deep. There are warning signs before crossing the path but I'm sure many people are drawn by the adventure of seeing what is on the other side and return to a water covered path. Maybe I should call it "Beware, Tidal Meadow" or "Check Your Tide Chart Before Crossing".. The Associate Artist Exhibit is from January 11, 2013 to February 23, 2013. 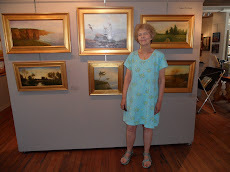 This art association in Old Lyme Connecticut has a long history and is situated near the famous Griswold Museum where the American Tonalists and later the American Impressionists gathered to paint in the summers. A wonderful place to visit.